Kym Gyngell (born 15 April 1952, Melbourne), also credited as Kim Gyngell is an Australian comedian and film, television and stage actor. Gyngell won the Australian Film Institute Award for Best Actor in a Supporting Role in 1988. In the late 1980s, he appeared in The Comedy Company and developed several popular characters, a few of which survived beyond The Comedy Company. One of his characters, Col'n Carpenter (who neglects to pronounce the letter 'i' in his name Colin), is a slow Australian with unique speech mannerisms. Col'n went on to have his own sitcom that ran for two seasons, in the early 1990s. The Comedy Company was an Australian comedy television series first aired from 16 February 1988 until about 11 November 1990 on Network Ten, Sunday night and was created and directed by cast member Ian McFadyen, and co directed and produced by Jo Lane. The show largely consisted of sketch comedy in short segments, much in the tradition of earlier Sketch comedy shows, The Mavis Bramston Show, The Naked Vicar Show, Australia You're Standing In It, and The D-Generation. The majority of the filming took place in Melbourne. The show and characters had a significant effect on Australian pop culture, and had a cult following particularly on Australian youth. 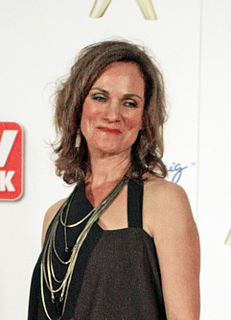 The word "bogan" was popularised by The Comedy Company character Kylie Mole, portrayed by Mary-Anne Fahey. Also in the early 1990s, Gyngell appeared (as Carpenter) in a series of public service announcements for the Alcohol Advisory Council of New Zealand. Gyngell was a regular on the popular Australian series Full Frontal during the mid-1990s, where he starred alongside Eric Bana before Bana attained Hollywood fame. His most notable characters included; "Leon" (Art critic who used to show up on talk shows and say the word "Crap"); and as characters sending up Kerry O'Brien (host of the ABC's The 7.30 Report ) and John Laws (former 2UE radio broadcaster). Full Frontal was an Australian sketch comedy series which debuted in 1993. The show first aired on the Seven Network on 13 May 1993, and finished on 15 September 1997. Full Frontal is also known for launching the television careers of Eric Bana and Shaun Micallef. Eric Banadinović, known professionally as Eric Bana, is an Australian actor and comedian. He began his career in the sketch comedy series Full Frontal before his first movie, comedy-drama The Castle (1997), got him noticed by global audiences. Soon after he gained critical recognition in the biographical crime film Chopper (2000). After a decade of roles in Australian TV shows and films, Bana gained Hollywood's attention for his performance in the war film Black Hawk Down (2001) and the title character in Hulk (2003). He has since played Hector in the movie Troy (2004), the lead in Steven Spielberg's historical drama and political thriller Munich (2005), Henry VIII in The Other Boleyn Girl (2008), and the villain Nero in the science-fiction film Star Trek (2009). Bana also played Henry De Tamble in The Time Traveler's Wife (2009). In 2013, he played Lt. Cmdr. Erik S. Kristensen in the war film Lone Survivor and in the following year he played police sergeant Ralph Sarchie in the horror film Deliver Us from Evil. Once he left Full Frontal, he had a few guest roles, including comedy programs The Micallef Program and Pizza , and on drama series The Secret Life of Us , CrashBurn and Love My Way . Pizza/Fat Pizza is an Australian television series on the Australian television network SBS. The series has a spin-off feature length movie, Fat Pizza, released in 2003, and a best-of highlights video/DVD that featured previously unreleased footage and a schoolies exposé, released in 2004. In addition to this, a theatre show entitled "Fat Pizza", starring several characters from the show, toured the Australian east coast. In 2014, the storyline of the series was combined with that of Housos to create the motion picture Fat Pizza vs. Housos. The film was shown in Australian cinemas from 27 November 2014. The Secret Life of Us is a three-time silver Logie Award-winning Australian television drama series set in the beachside suburb of St Kilda, Melbourne, Australia. The series was produced by Southern Star Group and screened in Australia from 2001 to 2005 on Network Ten and on Channel 4 in the UK. Initially co-funded by the two networks, Channel 4 pulled out after the third series and the fourth series was not aired in the UK. It is primarily a drama with some comedic moments. CrashBurn is an Australian 13-part drama series airing on Network Ten, about surviving long-term relationships in an age where multiple partners and multiple orgasms are considered a birthright. Since 2007, Gyngell played Father Harris on the ABC comedy The Librarians . The Librarians is an Australian television comedy series which premiered on 31 October 2007 on ABC TV. 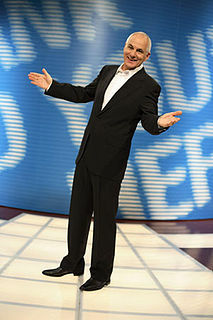 In Ireland, the show airs on RTÉ Two. The series is produced and written by Robyn Butler and Wayne Hope who are also the principal cast members. Hope is also the series' director. The first series comprised six half-hour episodes. The second series with another six episodes began airing on 5 August 2009 and was filmed at the Royal Melbourne Showgrounds. Very Small Business is an Australian television comedy series first broadcast on Wednesday 3 September 2008 on ABC1. The series is written by Wayne Hope, Gary McCaffrie, and Robyn Butler, and produced by Hope and Butler. It comprises six half-hour episodes. In 2010, he had a role in the TV series Lowdown . In 2012, Gyngell played Paddy the Montebello family's shady accountant in The Straits . Both aired on ABC1. In 1985, Gyngell starred in his first film Wills & Burke playing William John Wills. In 1988, he played Ian McKenzie in Boulevard of Broken Dreams , which earned him an AFI award for Best actor. In 1988, he appeared in Bachelor Girl (1988) and in Grievous Bodily Harm . In 1990, he was in What the Moon Saw , and starred in Heaven Tonight which earned him an AFI nomination. In 2000, he starred in the surprise hit of the year, in the comedy The Wog Boy , playing the Supervisor; In 2002, he played the character of Paul in The Hard Word and as Richard in Blow . In 2005, he was in The Writer . Gyngell played with various theatre collectives in the early 1970s, such as La Mama, The Pram Factory, Hoopla (the predecessor of the Malthouse Theatre, Melbourne). In the late 1970s, he performed with the Sydney Theatre Company. In 2003, Gyngell played Robert in a production of David Auburn's play Proof . In 2008 Gyngell played William in the two-hander Ninety by Joanna Murray-Smith at the Melbourne Theatre Company (MTC); Later that year he played Tartuffe in Molière's The Hypocrite at the MTC opposite Marina Prior and Garry McDonald. In 2012, Gyngell performed in Sydney Theatre Company's production of Pygmalion . His second cousin is the former CEO of the Nine Network, David Gyngell, and his older brother is former diplomat and Office of National Assessments head Allan Gyngell. John Russell Waters is an English-born film, theatre and television actor, singer, guitarist, songwriter and musician best known in Australia, where he moved to in 1968. He is the son of Scottish actor Russell Waters. John Waters has been in the industry for over 40 years, and was part of the Australian children's television series Play School for almost 20 years. Nicholas Giannopoulos is an Australian stand-up comedian, film and TV actor and film director of Greek descent. He is best known for his comedy stage show Wogs Out of Work alongside George Kapiniaris, the television sitcom Acropolis Now and the film The Wog Boy and has been described as "Australia's leading exponent of "wog" humour". Paul McCarthy is an Australian comedy actor. He is best known for sketch comedy television series Comedy Inc.
Stephen Curry is an Australian comedian and actor who has appeared in many television drama and comedy series, and feature films. Francis Greenslade is an Australian comedic actor. He also teaches acting. Colin Friels is a Scottish-born Australian actor. Monica Maughan was an Australian actor with roles in film, theatre, radio, television and ballet over a career spanning 52 years. Rosalind Hammond, and often credited as Ros or Roz, is an Australian comic actress and writer with an extensive career in theatre, film and television. Grant Piro is an Australian actor. He is best known as the host of the children's television show Couch Potato on the Australian Broadcasting Corporation. Frank Michael Howson Melbourne) has had a career in entertainment. He directed Flynn (1996) on the early life of Errol Flynn and Hunting (1991). Howson, with Peter Boyle, helped establish Boulevard Films which produced thirteen films from Boulevard of Broken Dreams (1988) to Flynn; besides producing for Boulevard Films, Howson often wrote scripts and directed. Gerald William Connolly is an Australian comedian, actor, impressionist and pianist. He is best known for his satirical caricatures of public figures such as Queen Elizabeth II, Prince Charles, Margaret Thatcher, Joh Bjelke-Peterson, Bob Hawke, Paul Keating, Bill Collins and Dame Joan Sutherland, amongst many others. Mitchell Patrick Butel is an Australian actor, singer, writer and director. He is best known for his work in theatre, including musical and opera productions. From March 2019, he will be the Artistic Director of the State Theatre Company of South Australia. ↑ "The Librarians – TV Review". The Age. Melbourne: Fairfax. 13 November 2007. Retrieved 27 December 2007. ↑ "A Cry in the Dark (1988) – Release dates". IMDb.com. Retrieved 2012-06-15.